Many travel guides will tell you where a certain hotel or restaurant is located by its arrondissement. What is an arrondissement? It's a district and administrative unit of Paris. Each has it's own look and feel, and it's own administration. At one time, many of them were their own little villages until they grew into each other and became Paris. 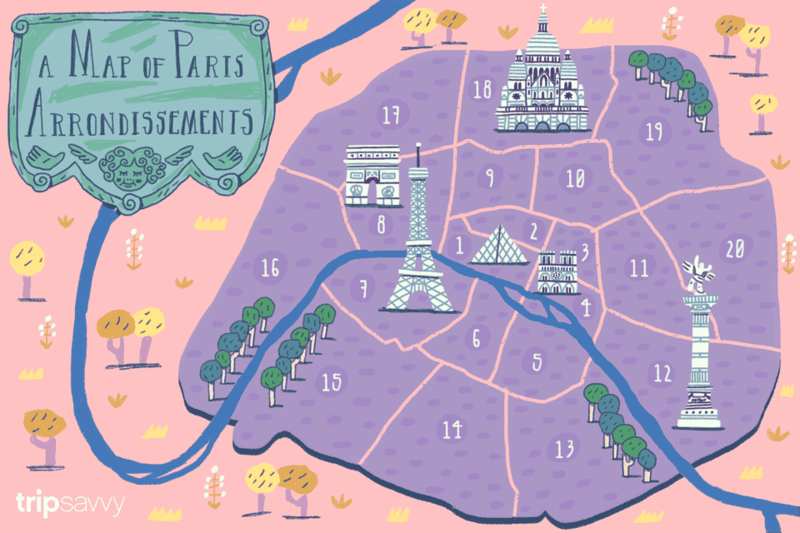 Above is a map of Paris to help you visualize the location of those arrondissements. As you can see, Paris is divided into 20 of them. They start on the right bank of the Seine and spiral around the central core of Paris. If this is your first vacation to Paris, you'll probably want to be located near the Seine, where there is a larger concentration of things tourists come to Paris to see and do. Experienced travelers suggest the 4th, 5th, or 6th Arrondissements. The 4th is known for its wealth of historic sights and includes the neighborhoods of "Beaubourg", the Marais and the Ile St-Louis. The 5th arrondissement consists of the historic heart of the Latin Quarter, with attractions like the "Pantheon, the Sorbonne University and the botanical gardens known as the Jardin des Plantes" according to Courtney Traub's excellent guide: What to See in Paris by Arrondissement (District). The 6th includes the neighborhoods called Luxembourg and Saint-Germain-des-Prés. St. Germaine is an oft-recommended place to look for a Paris Hotel. Writer David Downie, a resident of Paris, calls these arrondissements " the magic circle" from which tourists seldom stray. He encourages you to try his favorite Three Ethnic Neighborhoods. Paris is served by a great public transportation, including buses, taxis and light rail. There are six train stations in Paris, which you'll find located on our Paris Train Stations Map. The map shows the stations and the arrondissement they occupy. For travel within the city of Paris, you'll want to peruse the Complete Guide to Paris Transportation. To save on public transportation you may wish to look into the Navigo pass or the transportation pass designed for tourists: Paris Visite Pass. You can also see Paris via those hop-on, hop-off tour buses, or take a cruise down the Seine river. See the Top Paris Tours from Viator for transportation and day trips from Paris information. Versailles makes an interesting day trip you can make via Paris public transportation. Monet's Gardens in Giverny, especially in the spring, makes a fine excursion into the French countryside in the region of Normandy. If you're traveling with kids, there's also always an excursion to Disneyland Paris to consider. Paris Travel Guide - Get information on Paris discount passes, food, lodging, day trips and more. In France, the months of July and August are traditionally when the French take their holidays. Thus the less touristy places will be pretty quiet and the seaside resorts crowded.